viaLibri ~ Vorlesungen über die Theorie der automorphen Functionen. I. Die Gruppentheorietischen Grundlagen; II. Die Functionentheoretischen Ausführungen und die Anwendunge. [TWO VOLUMES]. Vorlesungen über die Theorie der automorphen Functionen. I. Die Gruppentheorietischen Grundlagen; II. Die Functionentheoretischen Ausführungen und die Anwendunge. [TWO VOLUMES]. 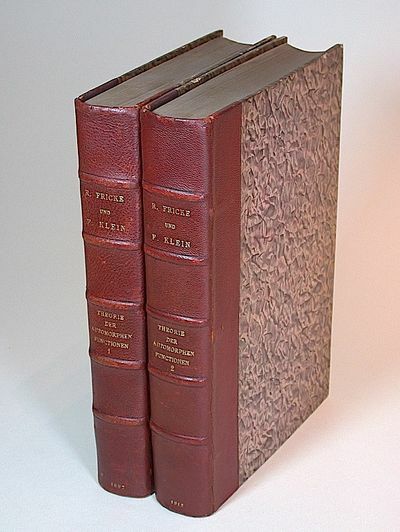 Leipzig, Teubner, 1897-1912.. Two volumes. Crown quarto. Pp. xiv, 634, with 192 text figures; xiv, 668, with 114 text figures. Hardcover, uniformly bound in contemporary quarter calf and marbled boards, spine with raised band, gilt lettering, marbled endpapers, with the original printed wrappers bound-in, sporadic scholarly annotation in pencil. In fine condition. ~ First edition. Christian Felix Klein (1849-1925); Karl Emanuel Robert Fricke (1861-1930). On first free endpaper of each volume appears an old ownership stamp in the form of a Sanskrit svastika (meaning "good fortune" or "well-being"), a sacred symbol in Hinduism and Buddhism, with the owner's initials in the four corners. Extremely rare with the original publisher's printed wrappers of both volumes preserved in mint condition. [NOTE:] We offer also "Vorlesungen über die Theorie der elliptischen Modulfunctionen", original 2-volume set in identical binding to the present set.